Last night I attended an amazing seminar and dinner all about ICE!! The event was sponsored by the National Association of Catering Executives at Harrah's Casino in Chester, PA. Ice Caters provided the beautiful displays, education info and centerpieces. Most of us have seen the ice luge at the bar but what about ice martini glasses or ice votive holders? There was an ice bar during cocktails then for dinner every course was served in ICE!! Our first course was a Japanese Oyster Shooter served in an ice shot glass and our entree was a salad with salmon and shrimp served in a shell ice bowl. There are so many cool things that can be done to get that wow factor. 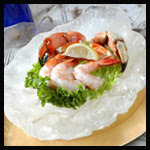 Even if you don't have the budget for ice bowls or ice glasses for every guest, what about ice serving platters with shrimp or sushi and a tray of ice shooters with cold melon soup passed during cocktail hour. 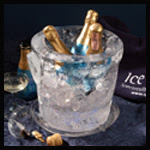 Impress your guests with champagne chilling in an ice bucket set on the bar. Prices are reasonable and the boxes come with instructions for serving or display. Check it out today! It's all about how to select a proper companion who utilizes your funds in a right way - that is incorporate it in real deals, parts and divides the profit with me.